Great work! 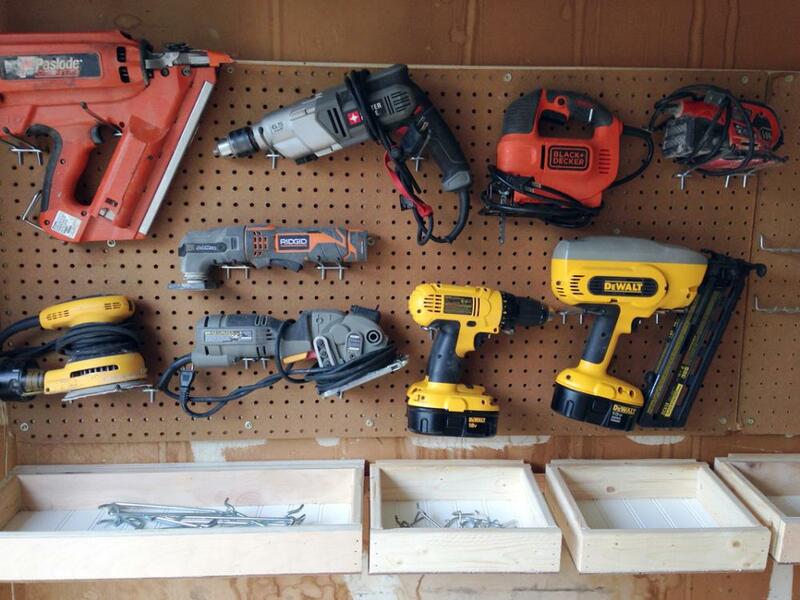 I’m totally going to use this design as my garage workbench, thanks for sharing it! Thanks! I use it almost everyday. Let me know if you have any questions about the build. Nice design, an improvement would be to make the right-most support swing left so that you don’t use any additional wall space when folded down. 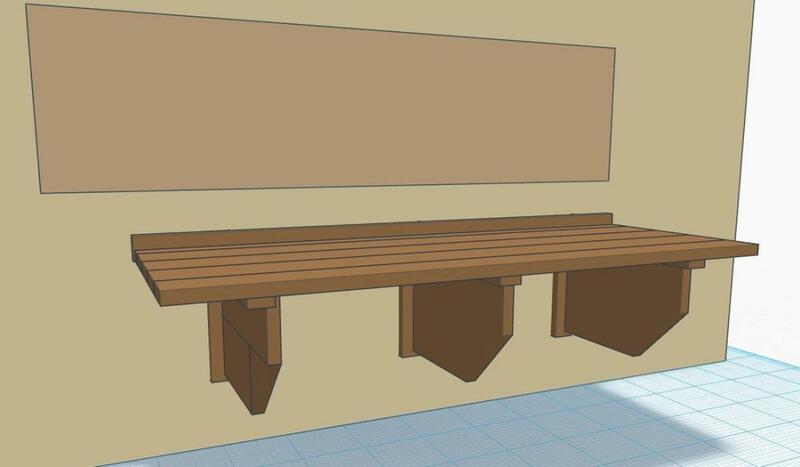 It would require either the middle suport to me recessed or the outer supports (and table-top) moved further out from the wall to cover them. Thanks for the suggestion! I considered that but the extra space the third leg took up wasn’t a big deal for me, and I wanted the legs sufficiently spaced to evenly distribute the weight of the table. You Sir, are a genius! I’ve always appreciated the work of clever carpenters who can make wonderful things with only some spare wood and their imaginations! It reminds me of my grandfather who was also very clever, and solved many problems in his tiny workshop! I really enjoyed this story! Thanks for the awesome feedback! I do love building things from scratch and doing tweaks here and there from daily use. 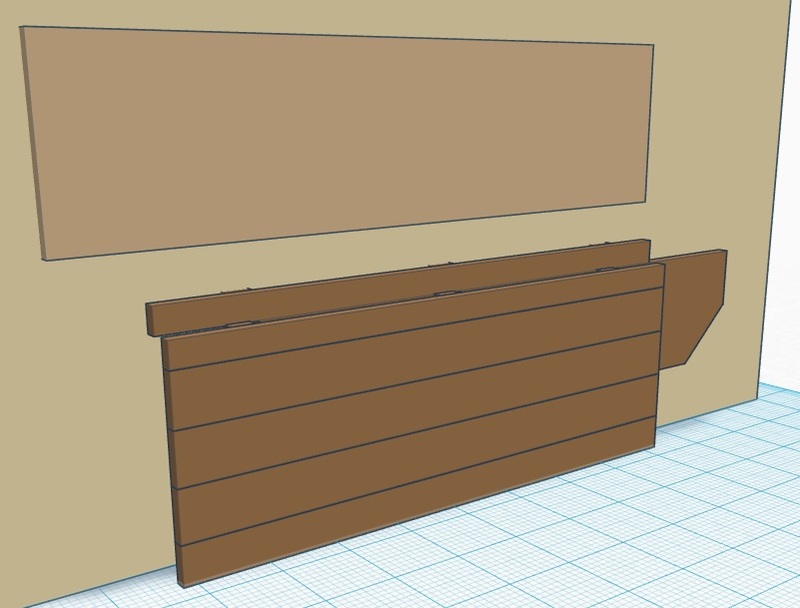 What’s really been a huge help for me lately was building some of my more complicated designs in software (like TinkerCAD) before cutting any wood. 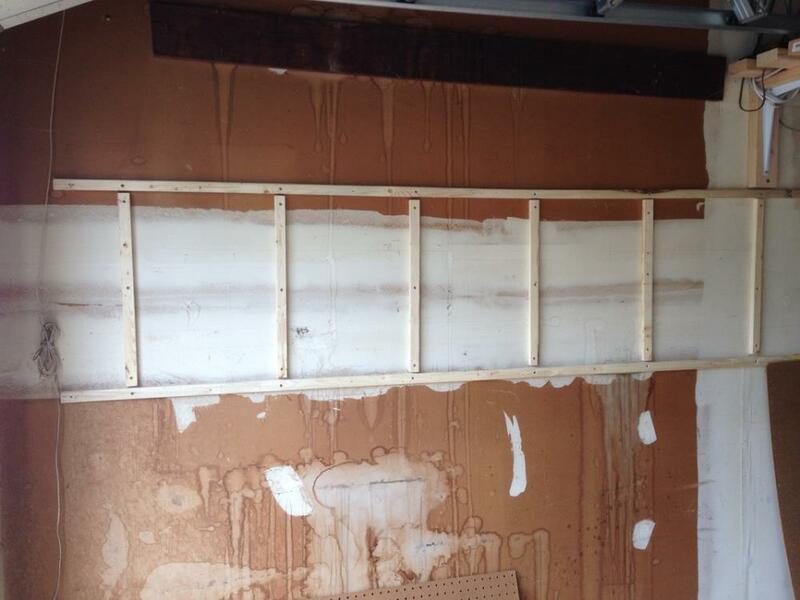 I can build and see my idea virtually, and when I’m happy with the result, I hop into the garage and get my hands dirty. Thanks again! You could run a tie bar with pivot holes bolted across the bottom of each folding support to create a 1 touch open/close system for that bench. I like the heavy duty construction, but the fact that it still packs away quite tight to the wall. Great Job! Great suggestion! I’ll consider something like that for future upgrades. It would be a nice timesaver to just grab the exposed (when table folded down) leg support on the right and swing open all the legs at the same time. This is so awesome! 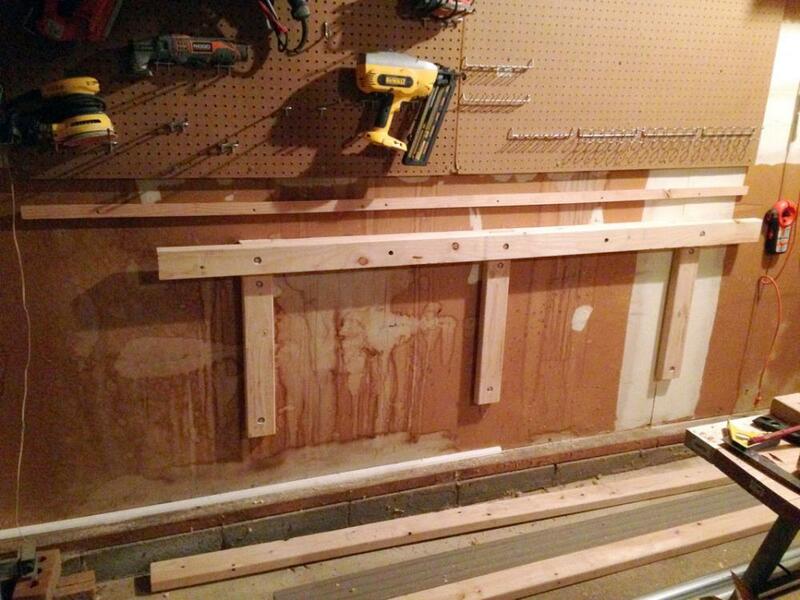 I have had the same problem for years…small two car garage with no room for a workbench. This changes everything! I can’t wait to build this and start working on more projects. I’m glad you like it! The garage floor and driveway was my work bench prior to this build. Btw, the removable French cleat shelves have turned out to be really useful when I need to fold down the table – if there’s a clutter and I don’t feel like putting it all way, I just grab a nearby box shelf and fill it up temporarily, toss it back on the wall and fold the table down. Very convenient. This is an excellent idea. Thanks for sharing it. Underside cleats are a great idea. 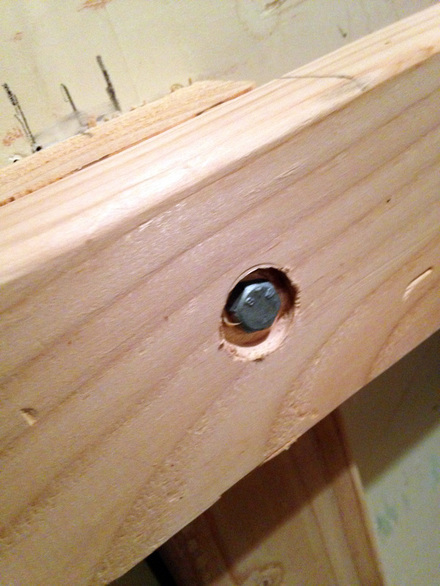 If I had thought of that, I may not have bothered with the bolts. I’ll keep that design in mind for future projects though. 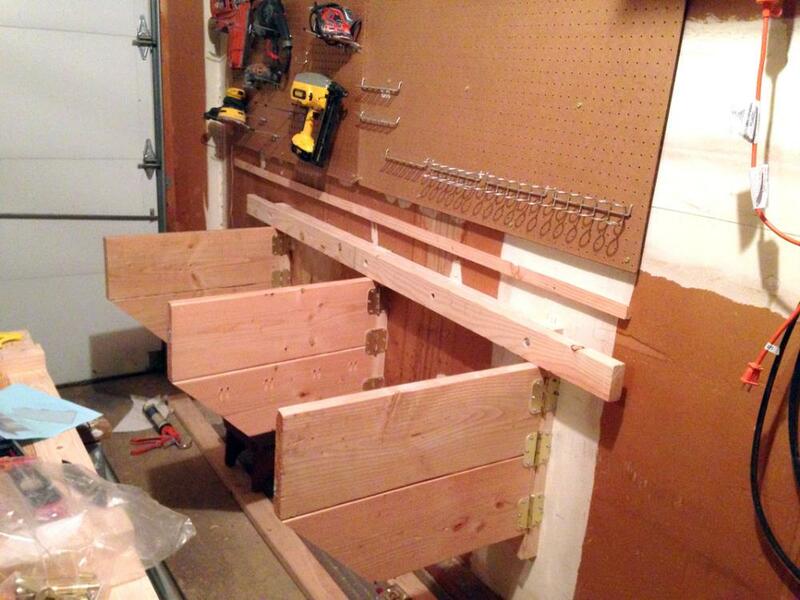 The garage is pretty much my creative outlet, so lots of crazy contraptions have yet to be built. Thanks for this description. 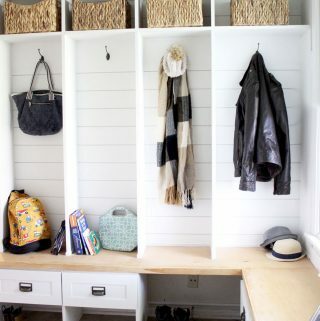 It looks great and I’m planning to adapt it to make a similar style fold-away desk for my son. 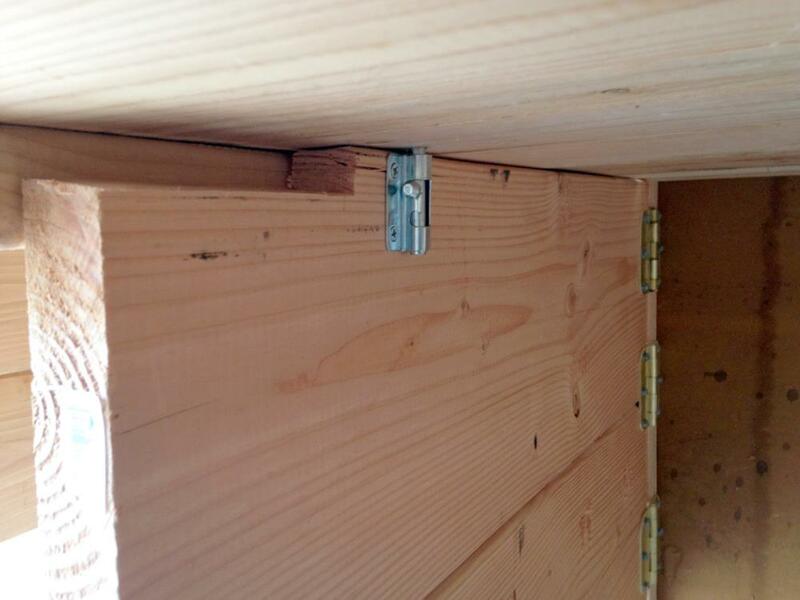 On the suggestion of cleats under the table top, how thick a cleat would it need to be to be effective? 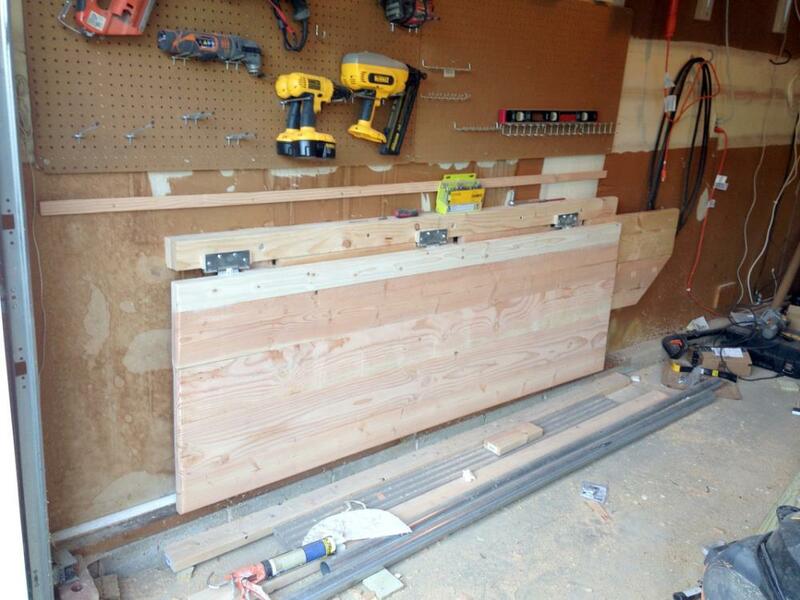 My plan is for a smaller work surface, likely 36″ x 24″ with just two supports on the ends, which would fold in to each other in the middle. The tie bar is a great idea with all supports folding the same way. Any thoughts on how I might create a similar easy-open mechanism with two supports both folding into the middle? 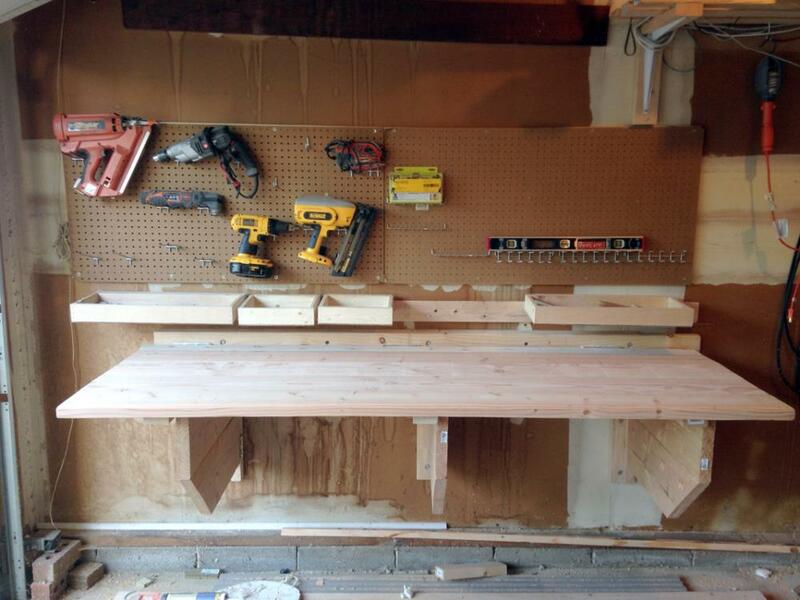 Thanks for the inspiration, copied you plan on a smaller scale to make a work bench in a smaller garage. Wish I had that much real estate to play with! I hear you, my previous home had a 1/4 size garage (the rest was converted to a room). The design is pretty scalable though, just reduce the number of legs accordingly. It could probably go as small as one leg too. I’ll definitely second your recommendation of the Habitat Re-Stores. Every time I go there it’s ‘kid in a candy store’ time. This is my clamp storage solution for my garage workshop. Like your I have to share it with other stuff, it works really well, and all it took was an old bicycle wheel and a long lag bolt into the beam. Excellent idea, cool execution. Did you save your design on Tinker CAD? Can I go look it up? Thanks! Brilliant. Enjoyed the detail. Inspired to create something similar. Thanks. I see this in my backyard as a potting bench!! 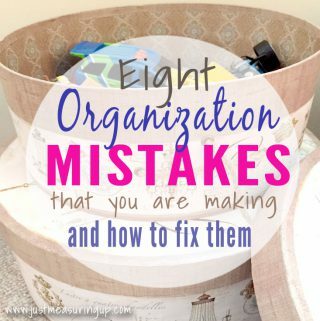 Great idea and easy to follow plan! Thanks for sharing at the DIY party! I LOVE this idea and build! We are having a shop built on our farm right now and I would love to add this to it! I love that you shared detailed pics! Thanks Laura! Ash LOVES the workbench. It’s such a space saver and we can still get both our cars in the garage. He’s already making plans for another folding work station. Nice design. It looks so sturdy and strong! Thanks, Patty! It worked out really nicely:) Have a great week! such a great idea! Now I need one …or two…or twelve! I love projects like these. It’s perfect for those of us who need space to work, but don’t have room to spare for a ‘workshop’ area. Thanks for sharing at the #happynowlinkup! You guys really should have your own home improvement show! This is awesome! Thanks for sharing at the Simple Homestead Blog Hop! Such a creative and practical idea! That’s such a brilliant idea. All that extra work area without compromising on space and I loved the way you explained everything Ash. May I ask why the legs swing towards the right instead of the left towards the garage door? I’m glad you liked the project! As for the swing direction, its a matter of preference. I had future plans for the area to the left of the table, and if the legs swung to the left, it would interfere with my plans. So I made the legs swing to the right. I definitely need to make one of these! Thank you for sharing with us at last weeks To Grandma’s house we go party, you will be featured in the next party opening tomorrow morning 🙂 Have a great week! Thanks so much, Tarah!! We were so excited to see the feature 🙂 Have a great week! Thanks Janice – have a good week! This is a great idea. 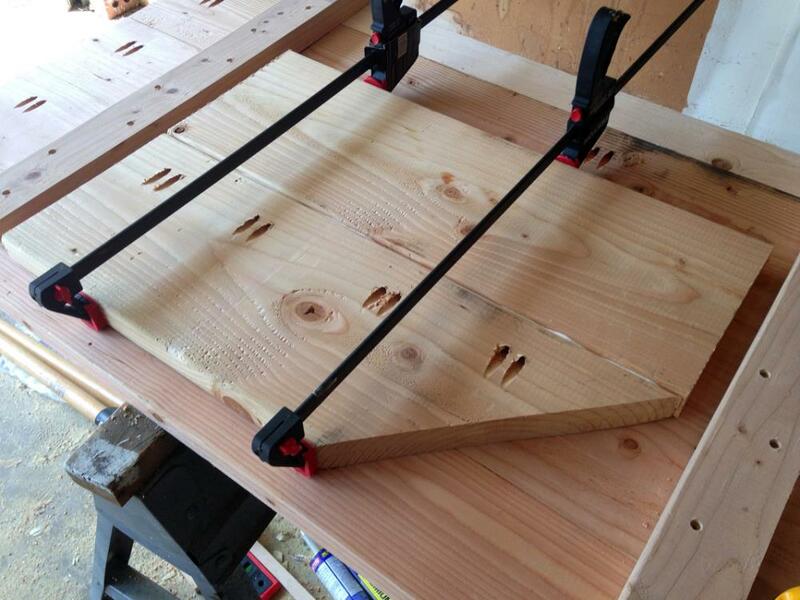 I’d love to have a folding work bench. Thanks for sharing the tutorial with us at Snickerdoodle. Pinning. 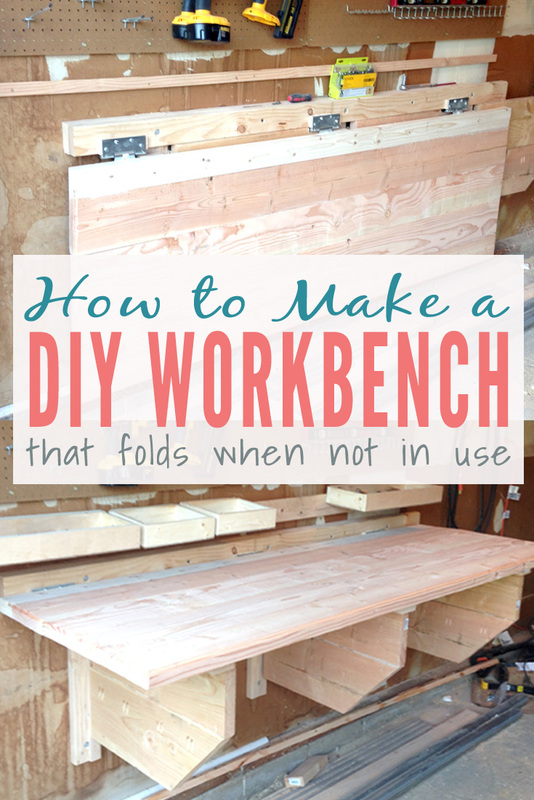 A folding workbench is a fantastic idea. Excellent tutorial. Thanks for sharing at Vintage Charm. Hello! 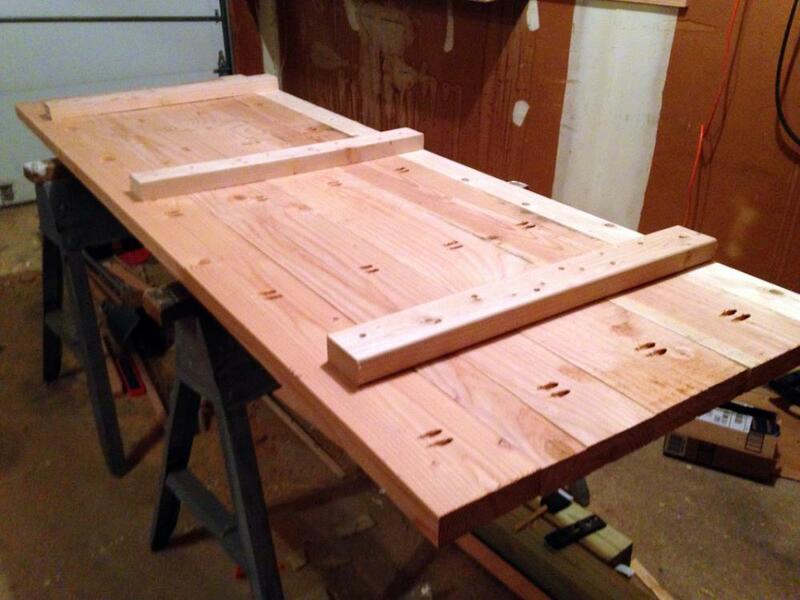 I wanted to let you know I’ll be featuring your workbench at tonight’s Funtastic Friday Link Party! Thanks so much, Angie!! So excited to see! 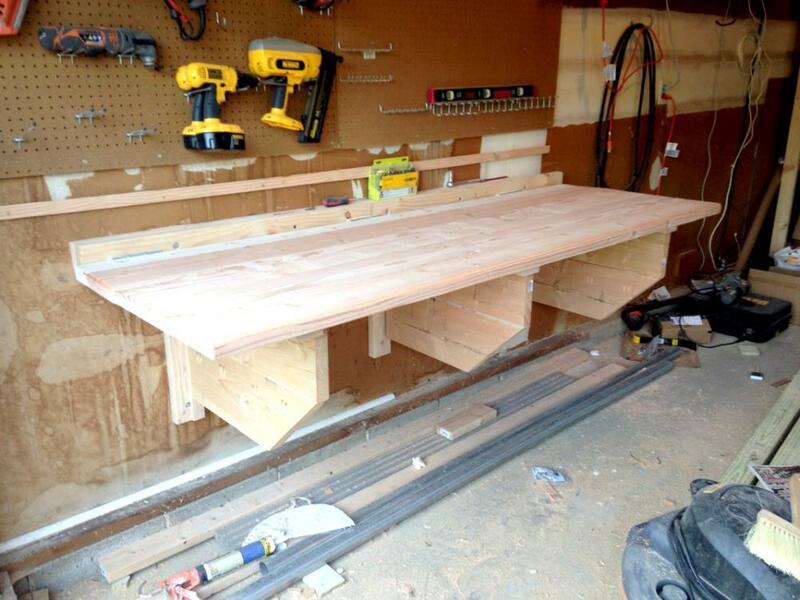 I used your design in building a folding workbench in my garage. It was exactly what I needed for my 1 1/2 car garage and it turned out as very good. Thanks so much for your innovated design and construction details. I did some mods like a glued and screwed plywood topped with masonite for the top. Extremely useful. Thanks again. I know it’s over a year later but I did use your design and it worked really well. Like you, virtually everything I used were reused items, like 10″ boards from an ice rink I don’t build anymore [global warming?]. 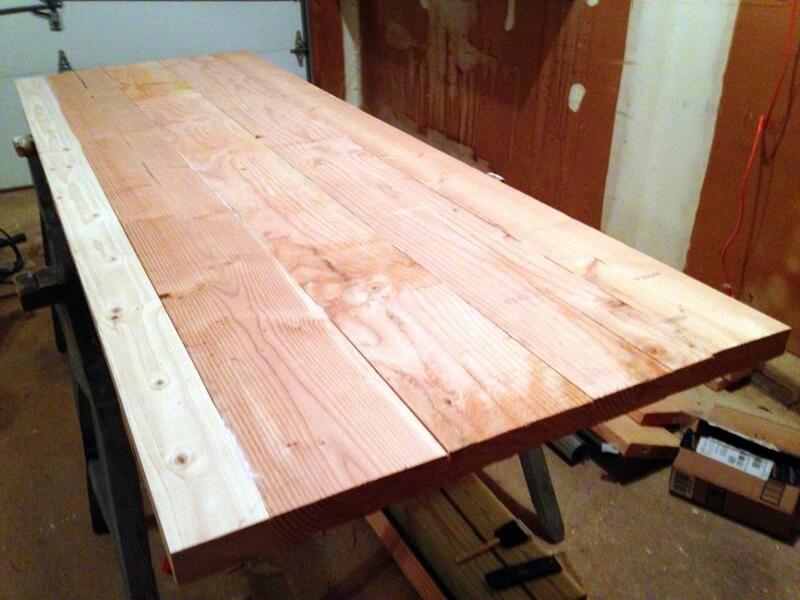 The counter was recycled from a basement office we tore down years ago. 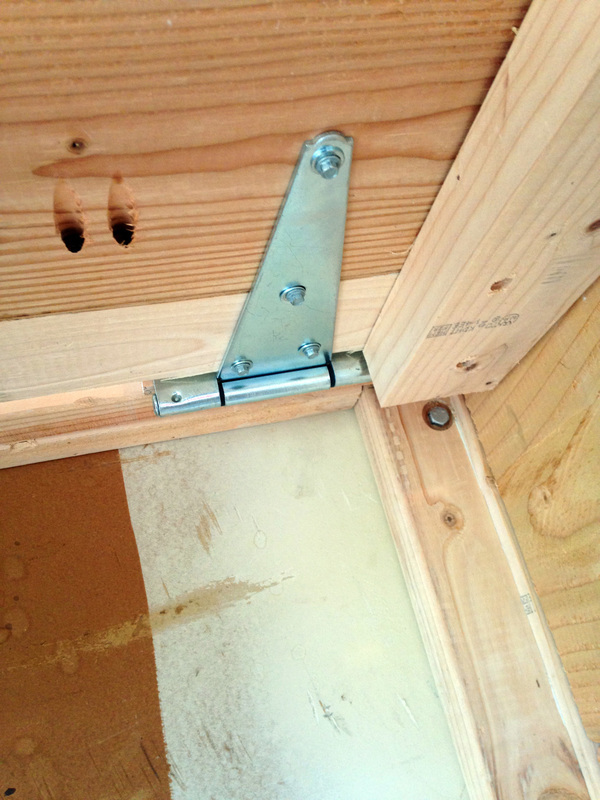 Habitat – for hinges except the gate hinges that I paid full price for!! 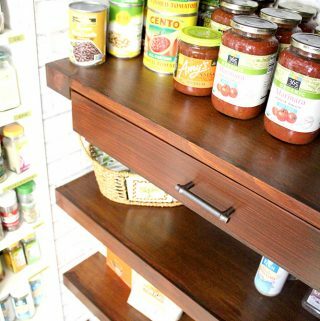 The only problems I had was with allowing space for the hinges. 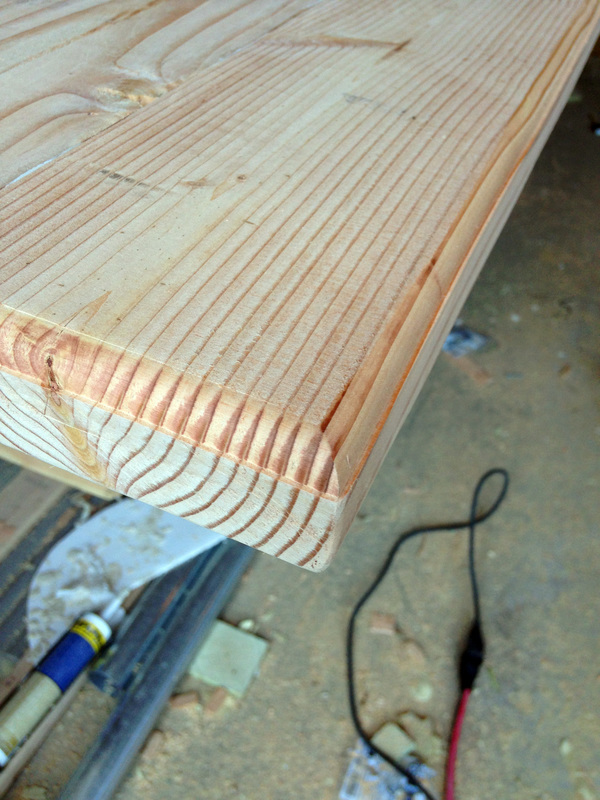 I had to add a 1/4 inch filler to bring out the horizontal 2×4, else the table top would not fold completely vertical. The same with the gate hinges. I will have to raise the height of the legs about an eighth of an inch to make their top edges flush with the bottom of the table top. I had to have both legs fold inward so, for the middle support, I will have to come up with something else, perhaps a hinged 4×4? ?